Rules of Golf: When Is a Bunker Not a Bunker? When Is a Bunker Not a Bunker? • The ball in the photo above is not in the bunker, because it lies on grass covered ground within the bunker. • A stacked turf bunker face (also known as a revetted bunker face) is not part of the bunker. • A natural, earth wall of a bunker is part of the bunker, even though there may be no sand left on it. • An artificial wall of a bunker (e.g. lined with wooden sleepers) is an immovable obstruction, unless a Local Rule makes the construction integral to the course. • A ball that enters an abnormal ground condition (e.g. a hole made by a burrowing animal) in a bunker, rolls underneath and past the margin of the bunker, is not in the bunker, because it is outside the margin, which extends downwards. 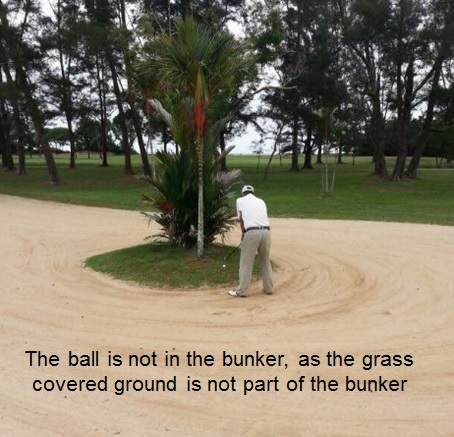 • A ball that partly touches grass that is outside the bunker and sand that is inside the bunker is in the bunker. • Sand that has spilled over the margin of the bunker is not part of the bunker, Decision 13/1. • A ball lies that lies on the edge of the bunker, overhanging the lip but not touching the sand, is not in the bunker, because the margin does not extend vertically upwards. • A ball that is completely embedded in the vertical lip of a bunker that is not grass-covered is in the bunker, so there is no relief for an embedded ball, Decision 13/4. • A ball that is lying on any type of obstruction in a bunker (e.g. a rake, or exposed plastic lining) is in the bunker, Decision 13/5. Finally, many modern golf courses have unmaintained, natural areas that are incorrectly referred to as ‘waste bunkers’, whereas they should properly be referred to as waste areas, because they are not bunkers within the Definition (as above). These waste areas typically have a sand, gravel or crushed shell surface area. They are sometimes designed by modern-day course architects as another difficult condition for golfers to negotiate, or more often, to reduce maintenance costs. In the Rules of Golf these waste areas are simply ‘through the green’. Like the famous London double-decker, red buses, blog awards seem to come along in twos! 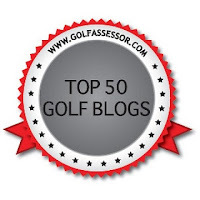 No sooner had I received my first blog award (see my previous blog, dated 23rd August) than I received notification that I have been included in Golf Assessors, ‘Top 50 Best Golf Blogs’, ranked number 6 this time. As far as I know, I am the only person in both of these lists of top blogs whose content is exclusively on the Rules of Golf. So please pass on my details to anyone else you know that is crazy enough to be interested in this fascinating subject. I have now published 1,998 Q&As on the Rules of Golf in my two books, ‘999 Questions…’ and ‘999 More Questions…’. The two books are totally complementary to each other, in very different formats. If you have the first book then I recommend that you purchase the second; if you purchased the second then I recommend that you now purchase the first. If you have not purchased either then you should immediately buy both. If you have already purchased both … thank you! Click here for more details on both the eBooks (from me) and paperbacks (from Amazon) publications. Hi Barry, what defines the margin of a bunker? In the example of a ball lying in a rabbit hole at the outer edge of the bunker how do you assess if the ball lies beyond the margin of the bunker? A "bunker" is a hazard consisting of a prepared area of ground, often a hollow, from which turf or soil has been removed and replaced with sand or the like. So, the bunker margin should be clear; it starts where the turf/soil has been removed. Sand spilling over the margin of a bunker is not in the bunker. If the ball in question lay in part of a rabbit hole inside the natural margin of the bunker, the player may take relief without penalty by dropping inside the bunker; if it came to rest in part of a rabbit hole outside of the bunker the player may take relief without penalty outside of it.